I am a Cold War baby. Born in the 60's, came of age in the 80's which fondly remember as the Yuppie Decade, of the big hair, linebacker shoulder pads and "Teflon Reagan". My parents and I grew up in the shadow of the Cold War, when we Americans wondered since we lived in fear of being nuked by the USSR. My mother still remembers Duck and Cover when you drop to floor, under your desk and cover your head in the unlikely situation when a nuclear strike occurs. Since the downfall of the Soviet Union, it has been an very interesting world, with free enterprise ruling the marketplace. However, it still blows my mind when I get Ebay packages from Romania, Hungary, Poland, Czech Republic, Ukraine and other former East Bloc states. Maybe it is difficult to let go, having grown up under the long shadow of the Cold War. There is a certain romantism in the Russian-American conflict since we knew our limits. Today, with the Middle East, the Arab countries, the Gulf war conflicts, we don't know who our emenies are, and the boundaries keep shifting, so it leave us unsettled. I do want to visit Prague, Hungary, and other Eastern Europe countries - that's on my bucket list. The architecture, the old world charm, the fact most of Eastern Europe wasn't rebuilt quite at the speed Western Europe was, so from what I hear, much of the Old World architecture is left alone, esp. Prague. I've had quite a few students from Ukraine, Russia, Poland and other Eastern European countries so I get a tiny glimpse into their former cultures. I have a glass beadmaker friend who is from Moldova, and she is hysterically funny, with her stories of Moldova, her years in Moscow at Russian universities and much more. I love hearing her stories. Maybe I am of Ukraine/German ancestory, but I find myself wondering more and more about the Old World. I can feel the different countries of my ancestors coming out - the Scottish, the Irish, the Russian, native American Indian, much more. I can feel them influencing me. My preference for cool/cold weather climate is definitely Scottish/Swedish/Russian. I do not like hot climates. My Indian ancestor has his influence in the way I observe nature, the sun, the moon, the earth cycles. I can tell the time of the day by checking the sun, and where is north, south, east and west. That is natural to me. In my search to find more vintage crystal buttons to finish a knitted necklace, I came across the fascinating world of Bohemian glass buttons. 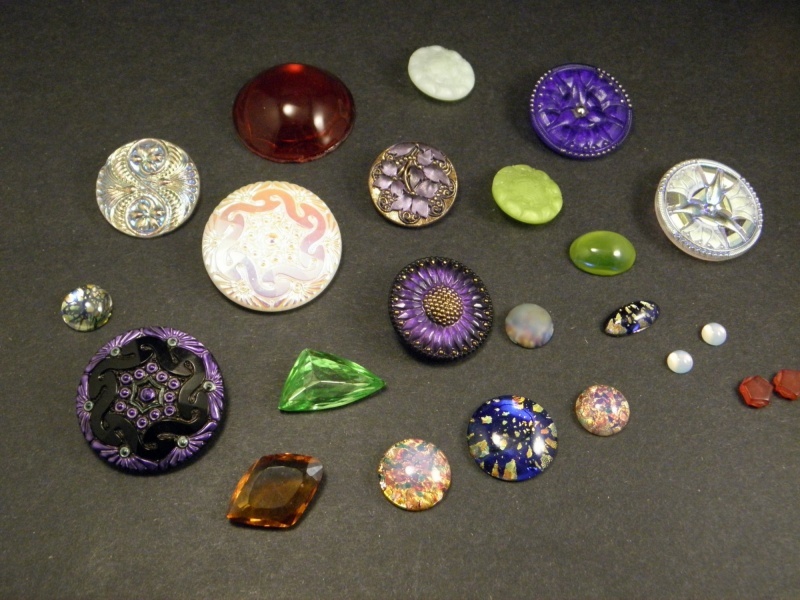 All of the Bohemian glass buttons were made in Jablonec in North Bohemia, formly Czechoslovakia. Since the fall of USSR, the borders of Eastern Europe has been opened, and all the local crafts have been making their way around the world. I am fascinated and blown away by the sheer variety of the glass buttons, glass beads, and fine quality faceted glass gems. I've been buying quite a bit of the lovely glass gems and buttons, which I will make into jewelry. All the glass gems in the picture above came from Czechoslovakia, which came the other day. I have more coming, so it will be fun to play with the new buttons and glass gems I've ordered. I find myself working more and more in glass. I first discovered hot glass ( glassblowing) in 1987 when I took a glassblowing class in college. I was a glass major for about a week and half before I transferred to Jewelry/Metals in undergrad college for it was really my true calling. However, I never lost my love for glass, and tried to incorporate glass and metal together for my flatware, but I was limited to what I could use. When I first came to Snow Farm Craft Program to teach in 2001, I met Nancy Tobey, and I got right back into lampworking glass. Since then, I've tried to make glass beads whenever I can. It's tough, since I don't have the equipment to make my own lampworked beads, so I try to do it at Snow Farm or at Sharon Art Center. I may not have much time to make my own beads, but I make up for it by being intense and working as much as I can in a limted timeframe. 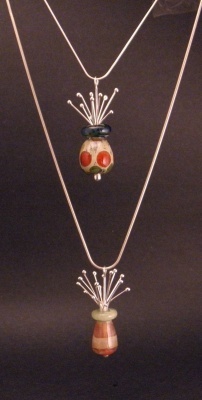 Anyway, in an attempt to bridge glass and metal together, I have been thinking of ways to use my glass beads so it is not just another bead strung on a neckcord, but carefully meshed with metal. I had made some glass beads in a vaguely vase-like shape, so I thought, a bouquet of flowers in a vase, so I used silver wire that was balled up to resemble flower buds. I'm glad I have a solid metalworking background, for it gives me a platform to work with when I am trying to do more with my glass beads. Here's the dilemma every glass artist faces - made glass beads, now what do you do with them? Therefore, I have been pairing up with glass artists to do Beads to Jewelry workshops and classes - first the students make glass beads, and then I take the students and show them what to make with their glass beads using wire and metal sheet. Glass is an utterly fascinating medium - it's not really a solid, but a liquid in suspension. Glass can be molded, shaped, blown, swirled, casted and more much to create so many things. It is a chameleon material, with the ability to be almost anything. The only problem is that it is brittle, so it does shatter or break easily. I have to be careful and use the glass in a way so that it is not too exposed such as necklaces and earrings. Glass rings or bracelets, I'm a little leery off, for I am a little rough on my jewelry, and many people are brutal on their jewelry. However, the allure of melting glass keeps calling me to the torch, so that I can melt glass and shape it the way I want it to be. As the glass beadmakers say, the song of the torch keeps calling. I so love using a torch for metal or glass. In fact, a student said to me today, I don't get unhinged when metal separates while soldering. I just calmly push back together what needs to be resoldered. Too many years of practice!